Sometimes gaming books languish in your collection without being used. You may not have time to read the information to use them. Or maybe your campaign couldn't incorporate the material at that point in the story. Here we have a suggestion on how to incorporate the Kid's Colouring Book o Critters. The book is unusual as it is designed to be both a supplement and a coloring book. It was created by two kids, age 6 and 10. The monsters found within are rather unusual. Not everyone likes the d20 games due to their complexity. Thankfully numerous people have taken the system reference documents and created retro-clones of the older games. Presented here is the quasta class for the Labyrinth Lord game. 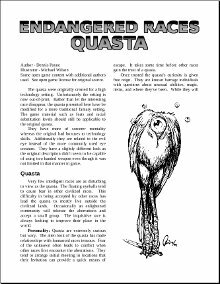 For additional information and a picture of the quasta please check out Endangered Races: Quasta available from rpgnow.com and drivethrurpg.com. A bird like creature floats towards you. A single eye dominates the body the aberration. Numerous other eyeballs dance in the air above the body. She introduces herself as Ai-Ai-Lee. She has heard of your quest to discover the cause of blight affecting your hometown. Her people also suffer from failed crops. She wishes to join your search. After the introduction of the GSL and the ending of the d20 system license various products became unavailable. Other material while still available is left abandoned with the original company gone or simply focused on other material. Endangered Races takes open game content and expands upon the original creation. The first in the series is the Quasta. Originally designed for a high technology setting, some modifications are needed to place the race in more traditional fantasy setting. After a series of mistakes, Lost Realms of Conflict shutdown. Una Corporation purchased the bankrupt Earthquakes Games. Many speculated about the reason but with no news interest faded. The release of the binocular vision monitor heralds the return of the Lost Realms of Conflict. The immersiveness of the virtual reality display is unprecedented. Lost Realms of Conflict quickly tops the MMORPG charts but something is not right. Players begin to disappear. Can you discover the secret before it is too late? 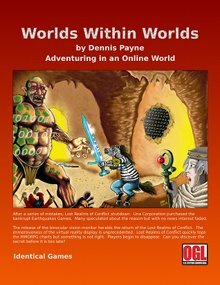 Worlds Within Worlds describes how to run a campaign set inside a massively multiplayer online role-playing game. The book uses the 3rd edition d20 system. While the book does describe a fictional computer game Lost Realms of Conflict, it includes suggestions for creating new settings or adapting an existing computer game.